So you may or may not recognise the beautiful Chyaz from her great YouTube channel, or indeed from her beauty/fashion/lifestyle blog chyaz.com. But what is she doing on my blog? As we’re both Manchester based, we decided some time ago that we should make the most of this and produce some sort of collaborative content, and voila, this is the result! Rather than your usual guest post, we’ve chosen to write about each other’s outfits in what I hope will provide a slightly different angle from the norm, and it’s always nice to read something about yourself too. We chose a trend, denim, then went away and each styled an outfit based on that. Co-incidentally we both chose denim dresses, but I think our different styles are exemplary of the fact that there are many ways to do the denim dress. I suppose I went with more of a vintage inspired edge with the thigh high boots and suede jacket, whereas Chyaz made hers quite chic with a black wedge and slick aviator sunglasses. She put her personal stamp on the outfit with a printed Michael Kors bag (also, can we talk about her incredible hair?!). I really love the dress itself, which is from Oasis, and the fact that it is more relaxed looking than my more utility style version. 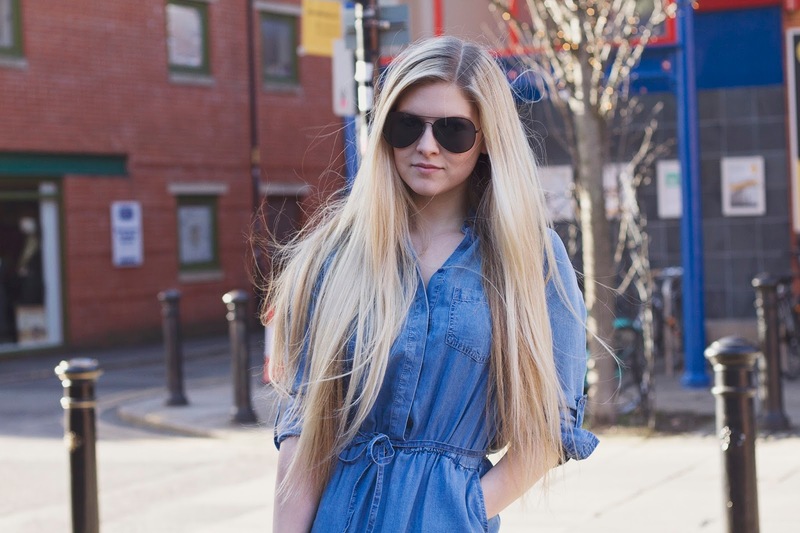 Let me know what you think of both of our takes on the denim dress, and how they look together – for more on my outfit including where everything is from, be sure to check out the corresponding post on chyaz.com! I love that you both went for denim dresses, I really like how vintagey yours is! 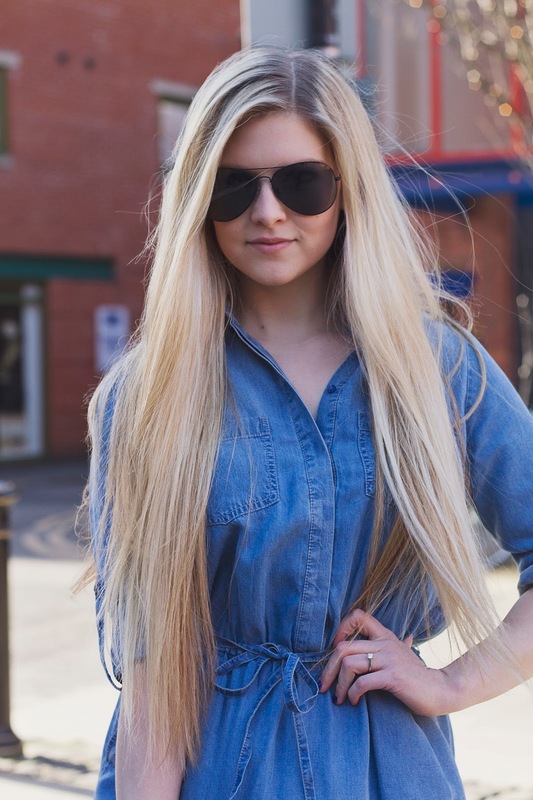 So glad that denim is here to stay – works for everyone and you can work it in so many ways! You both look great in your dresses! I recognise that street. Is it in the Northan Quarter? Your both look lovely. Your red hair looks amazing next to the denim! You both look great and cute idea to collaborate! Yes, you both pull off these denim dresses amazingly well! You both look absolutely gorgeous! I love collaborative/guest posts like this, definitely going to make sure that I check out hers as well.